A similar story and cast of protagonists is expected on Stage 18, as those with eyes upon the maillot jaune realise that time is running out to seize it before they find themselves charging through Paris for another year. Starting in Briançon and finishing atop the iconic climb of Col d’Izoard, the day totals 179.5km and should see the final melee from the most talented climbers at this year’s Tour de France. After a tame start to proceedings, the riders tackle the Côte des Demoiselles Coiffèes to ease the legs into the day, lasting 3.9km and wielding an average gradient of 5.2%. From here the road begins to subtly build upwards and directs the peloton to the base of the Category 1 Col de Vars (9.3km, avg 7.5%), which becomes much harder as the incline reaches double digits near the summit. What is likely to prove an explosive descent then follow, plunging back down into the valley, a downhill chase which may prove too technical for some riders to follow the attacks upon. 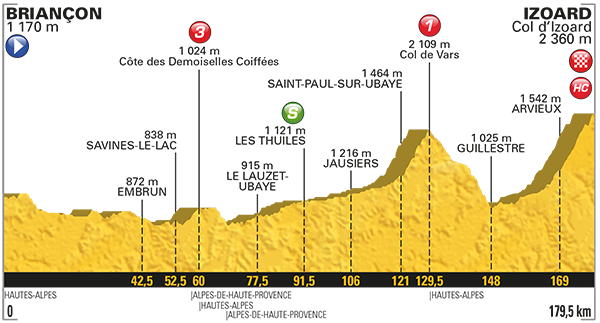 Everything then appears poised to be decided by the climb up Col d’Izoard, a task of 14.1km in length, with a somewhat misleading average gradient of 7.3%. Life is not too difficult as the riders ascend the opening 7km of the Col d’Izoard, though it is the second half which lays the foundations of a brutal war of attrition, fuelled by want of the yellow jersey. The latter half begins with a kick of 10% and then fails to do more than modestly drop below that for the rest of the way to the summit. A small dip in terrain occurs at Casse Déserte, though it is tortuous relief, as what follows leads to the constant grind of 10% in the final kilometre to the summit. The effort taken to win Stage 18 will prove monumental, but the effort to win Le Tour could prove greater still. Chris Froome may well end up winning this year’s race without ever having looked particularly threatening, a victory which looks likely to become his most defensively ridden grand tour thus far. He knows that an individual time trial still awaits in Marseille, making this more of a ‘do or die’ situation for his rivals than himself. All of the questions regarding his condition entering the race were answered with claims of aiming to strike his form perfectly for these final mountain stages; making today the perfect time to showcase this if true. Normally by now in the Tour de France we have seen Chris Froome decimate his opposition with neatly orchestrated attacks of immense power and timing, yet the evidence is scarce to suggest he is in that sort of shape at present. Regardless, if the game plan truly is to put everything on the line today, then a full strength Chris Froome is bound to prove impossible to follow for his rivals. Romain Bardet once again emerged as the most attacking rider from within the clutch of favourites who have a realistic chance of winning the race overall. As mentioned previously, the Frenchman relishes these tough Alpine stages and will consider much of this to be playing out within touching distance of his home region. Given the panache and swashbuckling tendencies he has, there is little doubt that Bardet will invest everything into winning Stage 18 and potentially Le Tour de France in the process. His team are strong on this type of terrain and have already proven capable of making life difficult for Team Sky when attempting to set Bardet up to gain time on his rivals. Though the Frenchman might not have enough to gain a race winning time gap upon Chris Froome, he is certainly talented enough to be first over the final 10% rise to the finish line. Rigoberto Uran is the dark horse lurking in the shadows during this final week of racing, calculating best when to strike and potentially steal the yellow jersey from beneath the noses of both Chris Froome and Romain Bardet. Yesterday saw him collect a clutch of bonus seconds and move up to second place on the overall classification, though it is the savage final kilometres of today’s contest which will determine how serious his chances of taking yellow really are. Thus far his most aggressive riding has often come on days where a descent has led into the finishing line, more often staying safe in the group of frontrunners and allowing the prominent favourites to tear strips off one another. This might indicate that Uran is anxious of entering into a full head to head battle in the mountains, or may have simply focused upon staying as fresh as possible for this decisive day. He is the one most likely to benefit from any cat and mouse games being played by Froome and Bardet late in the day, as the closer he can attack to the line, the better his chances are of utilising his explosive power to great effect. Mikel Landa would be a real contender for the yellow jersey if allowed to enter himself into the contest by Team Sky, yet has to commit his efforts into protecting the lead of captain Chris Froome instead. His form is no longer in question, as it is apparent how strong he is compared to the other major contenders right now, potentially being able to ride himself onto the podium if all goes well during Stage 18. Chris Froome is fully aware of Landa’s form and ambitions, perhaps agreeing to work as a double act to distance their rivals and earn the Basque climber a richly deserved stage victory in thanks of his loyalty. Dan Martin is the only rider who could prove strong enough to stay in contention and thus dominant any potential sprint from an elite group of riders. There is no doubt that Martin will feel aggrieved by his misfortune at this race, having lost time as a result of Richie Porte’s costly crash and his own team’s miscalculations during Stage 16’s brutal crosswinds. A podium place would have been within his grasp had things gone to plan, so now he must hope that a stage win is still achievable and will have a greater degree of freedom to push onwards in the final kilometres as the general classification battle rages on behind him. Other names worth considering are Alberto Contador, Serge Pauwels, Esteban Chaves, Darwin Atapuma, Daniel Navarro and Alessandro De Marchi. Posted on July 19, 2017 by Spokenforks	This entry was posted in Le Tour de France 2017, News and tagged Alberto Contador, Alessandro De Marchi, Briançon, Chris Froome, Col d'Izoard, Dan Martin, Daniel Navarro, Darwin Atapuma, Esteban Chaves, Izoard, Le Tour de France, Le Tour de France 2017 Stage 18, Le Tour de France 2017 Stage 18 Preview, Le Tour de France Preview, Le Tour de France Stage 18, Mikel Landa, Rigoberto Uran, Romain Bardet, Serge Pauwels. Bookmark the permalink.